TechSpot: An Easy Method to Speedup Windows 7 Login. Windows 7 Operating System loading time depends on the number of applications installed on the OS. Initially, the OS loads very fast, but as you install more software, OS will become sluggish. Many applications are designed to automatically start when your OS is loading. 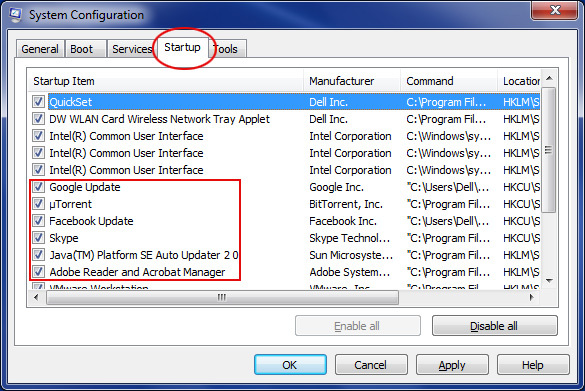 You can manage application start up behavior using 'System Configuration' utility. 3.Uncheck unwanted applications so that it wont run at the system start up. It wont harm your system if you uncheck all the applications. Now click 'Apply' and then 'OK'. 5. Restart the system and observe the loading time of the OS. The Windows 7 will load pretty much faster now!